A Guide to Specialized Transportation Services (Spanish version) for seniors and people with disabilities in Santa Cruz County is published by the RTC. This guide lists accessible transportation services available in Santa Cruz County including eligibility requirements, hours/schedule, service charges, service area, and more details. 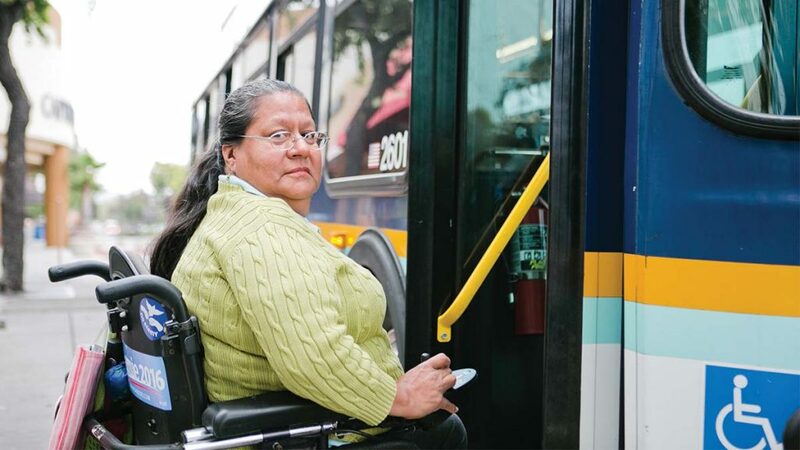 ParaCruz (operated by Santa Cruz Metro) and Lift Line (operated by Community Bridges) are key providers of local accessible transportation services. 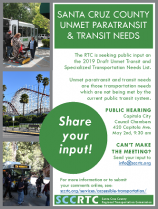 The RTC is seeking public input on the 2019 draft list of Unmet Transit and Specialized Transportation Needs. Public input may be provided in person at the April 2019 E&D TAC meeting or the public hearing at the May 2019 RTC meeting. You may also submit your input with the online form. The RTC’s Elderly & Disabled Transportation Advisory Committee (E&D TAC) generally meets every even numbered month and advises the RTC on planning, policy and funding issues affecting accessible transportation. All are welcome to attend the E&D TAC meetings. Voting members include citizens, representatives from groups/agencies working with seniors and people with disabilities, and transportation service providers.